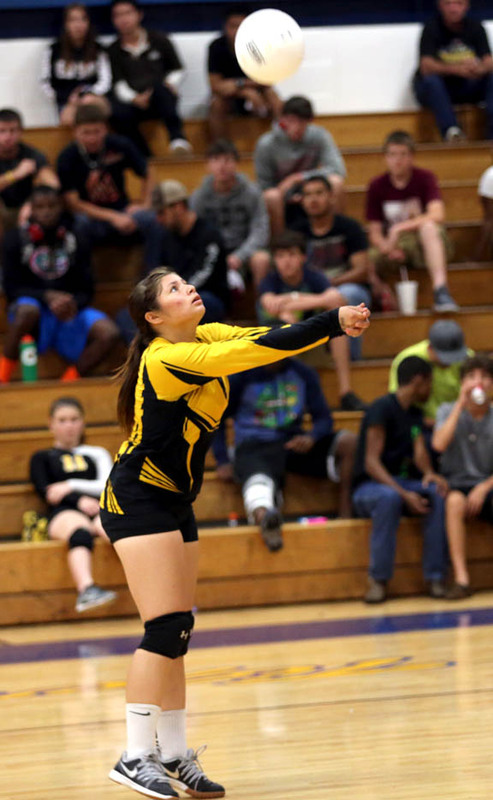 Moore Haven freshman Aleina Micco controls the ball Sept. 17 during a match against host Clewiston High School. 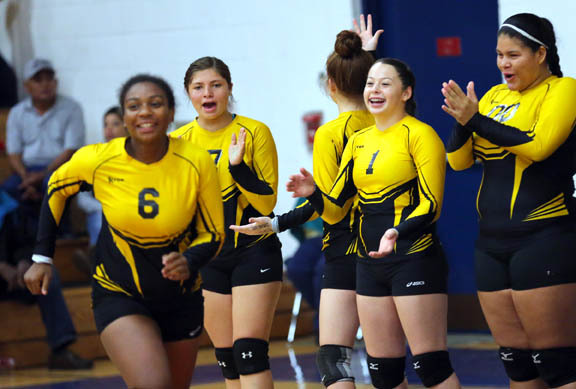 CLEWISTON — Alicia Fudge’s little dance in the middle of the team huddle had a purpose. Coming off a loss in game three, but still nursing a 2-1 lead, the Moore Haven High School volleyball team could have tightened up in a rival’s gymnasium Sept. 17, but the Terriers remained relaxed during a break thanks to Alicia’s impromptu performance. “That’s to keep the momentum going,” Moore Haven captain Tyra Baker said. 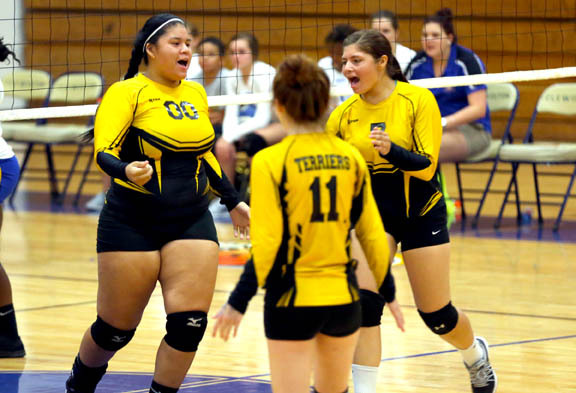 Moore Haven’s momentum helped the Terriers close out Clewiston in the fourth game. Scores were 25-15, 25-19, 19-25, 25-18 in a match that featured seven Seminoles: six on Moore Haven and one – Dayra Koenes – on Clewiston. Tyra Baker and Trista Osceola comprise half the senior class’s representation on Moore Haven. At the other end of the age spectrum is a youth movement led by Seminoles, including freshmen Alicia Fudge, Aleina Micco, Caroline Micco and sophomore Sunni Bearden. The victory was only Moore Haven’s third in its first eight games, but the Terriers haven’t let a sub .500 record dampen their enthusiasm. 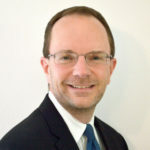 The team is adjusting to new coach Matt Hill, a former college volleyball player and high school coach from Pennsylvania. Clewiston was a non-district foe for Moore Haven, which faces an uphill battle throughout its Class 3A-District 9 slate. The six-team district is filled with private schools from Fort Myers and Sarasota with far lengthier playoff resumes. For example, Evangelical Christian School is a four-time state champion and Canterbury School has three state titles. As for Moore Haven, the Terriers have reached the state playoffs only once in their history and that came in the mid-1980s, long before the current players were born. Alicia and Sunni played against each other last school year in a regional softball final when Alicia attended Admiral Farragut in St. Petersburg; now they are Moore Haven’s biggest hitters on the volleyball court. When the fourth game against Clewiston was close, Sunni earned a service point thanks to Alicia’s kill that gave Moore Haven a 15-10 lead. Whether it’s serving, hitting or diving, Sunni has brought a lot of versatility to the Terriers in her second season. “She has completely stepped it up. She’s probably one of my biggest stars on the court,” Hill said. The job of setting up hits belongs to Aleina. The rookie is one of the team’s top servers, but she shines at the net, too. She set the ball for Tyra to deliver a kill that gave Moore Haven a 22-15 lead in game four. “She’s a beautiful setter; we just need to get her more vocal,” Hill said. 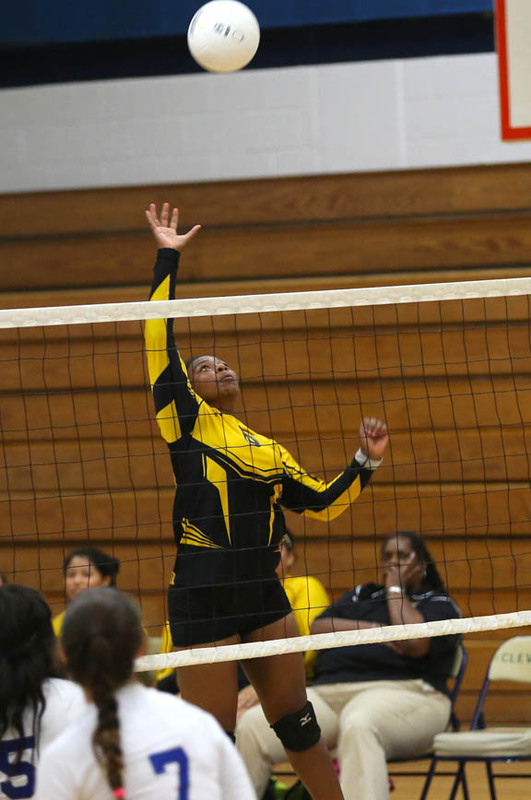 Meanwhile, Tyra juggles a variety of tasks, including middle blocker, hitter and cheerleader in her role as captain. “Absolutely a great leader,” said Hill, who also received a strong serving match from Trista and some key kills from Caroline. Moore Haven’s victory was its second this season against Clewiston, which plays in Class 4A-District 11. With only three teams in its district, Clewiston’s odds of making the state playoffs – two of the three teams will qualify – are far greater than Moore Haven. The loss left Clewiston with a 3-4 record and still searching for consistency as the season neared its midpoint. 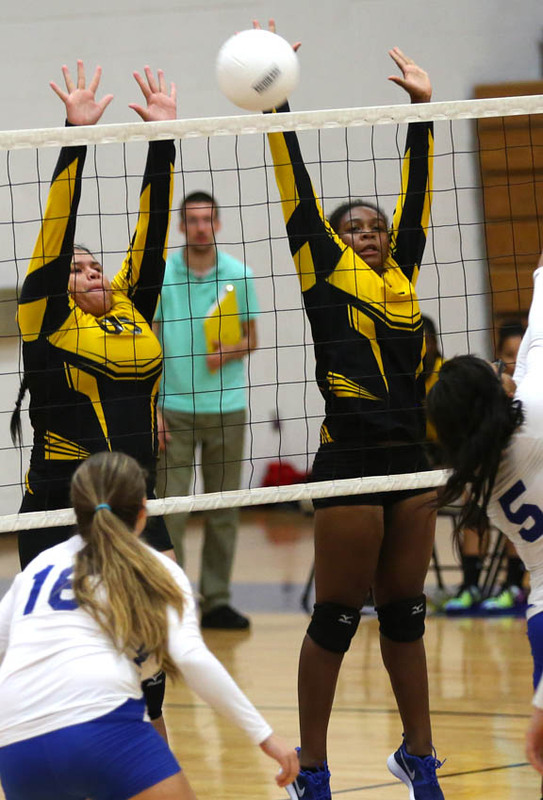 “I think we have a lot of talent on the team; we just need to work together,” said Dayra, a sophomore outside hitter who is in her second season on the varsity squad. 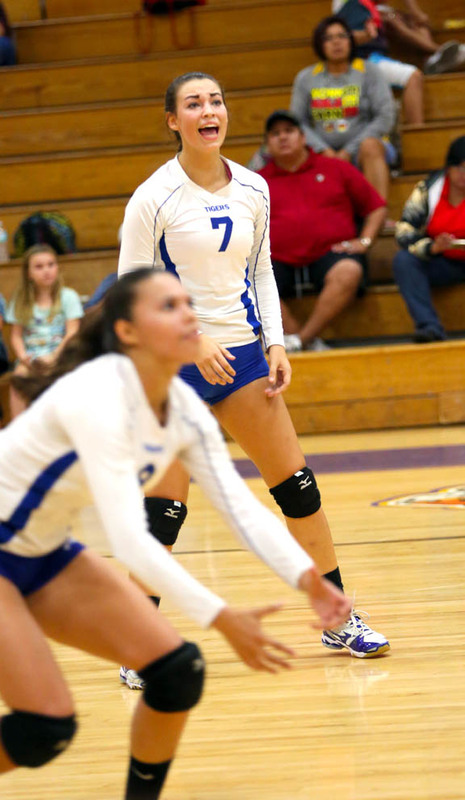 Dayra delivered a series of pinpoint serves that helped stake Clewiston to a 5-1 lead early in game two. 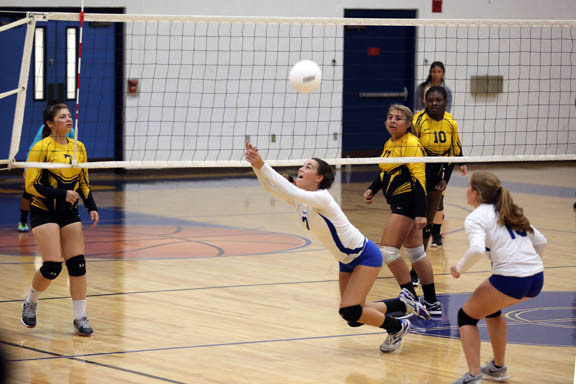 She also registered two kills in game three and topped it off with the winning service point for Clewiston’s only victory of the night. 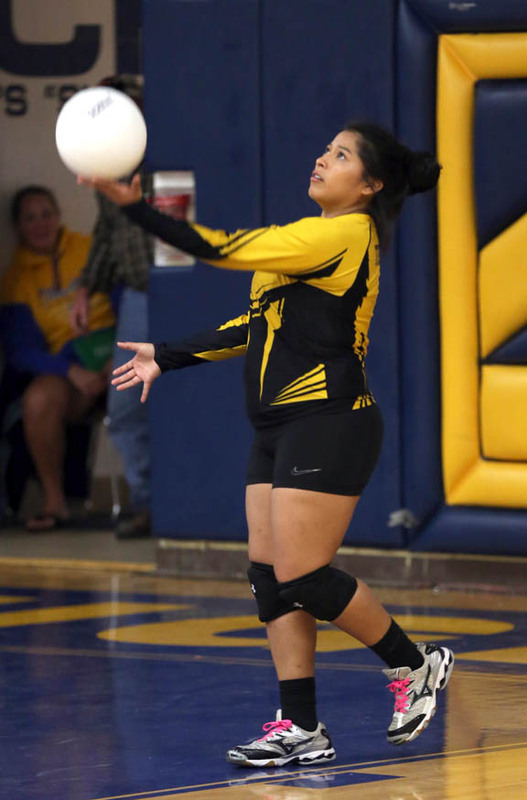 Compared to a year ago, Clewiston coach Samantha Ortiz said Dayra’s hitting has improved. “Her hits are stronger and her accuracy is better,” Ortiz said. Among Dayra’s kills from the outside was a crosscourt bullet in game four that kept the score close at 13-9 before Moore Haven pulled away. Unlike her fellow Seminoles on the other side – who were rotated in and out of the lineup – Dayra played the entire match. 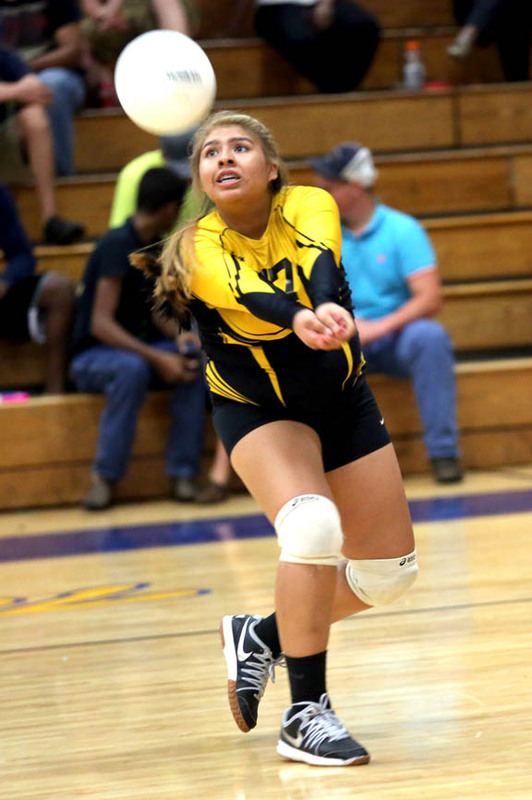 “She’s our starting outside hitter, so we really depend on her, but she’s only a sophomore so developmentally she has a little ways to go, but she’s going to be great,” Ortiz said.